This is a fascist incitement to violence. I can’t believe the President of the most powerful country on earth is allowed to act in such a childish and reckless way. He’s a dictator. And since the spineless treasonous sacks of garbage in the Senate will not lift a finger against him, America itself may fall. Should we survive, I will endeavor to never forgive the imbeciles and traitors who enabled them. They are not even worthy to be spit on. That’s what I’m talking about! Embrace the hate! Preach it! I am certainly glad that no one on the Right ever, or at least rarely, takes others out of context. Omar misspoke about CAIR, which was founded in 1994, she should have said the organization doubled in size after 9/11. It’s been a few months since a Trump supporter shipped bombs to the President’s list of “enemies”. I guess he thought it was time to update the list with new names. Trump after 9/11: Now my building is the tallest. King Trump speaks the truth. Please send him 20 coins and bow towards Trump Tower. He has always had erection envy. Not inciting violence. Tasteless, but not inciting violence. Any violence toward Ilhan Omar probably was already coming to her. The President of the United States is in no way responsible for what his followers do when they misinterpret his jokes. It’s a trend. Muslim ban, thousands of muslims in New Jersey cheered 9/11, now attacking her about her remarks even though there wasn’t much there. The goal is to keep a swirl of hatred going. Many of his supporters don’t care. Indeed, they feed off of this stuff. They love the implicit violence and the stochastic terrorism. It’s quaint to call it deplorable. Now it is everyday. Much of what you need to know about America today will be demonstrated by those who excuse this behavior, or deflect from it, or whatabout it, or subsequently assert that no single act can ever be attributed to non-specific language. You are right Ilhan Omar, some people did do something on 9/11! Yet America, in the aftermath of 9/11, attacked and invaded Afghanistan, Iraq, Syria. But none of the places our attackers came from. So Ilhan Omar don’t be surprised if the President attacks you for just a 4 second outtake from your 20 minute speech, we are known for not making sense, especially from the top on down. There is a distinction between inciting violence and giving implicit license to violence. Perpetrators of stochastic violence depend on this distinction for their moral survival. Trumps tweet will be defended, or deflected, or minimized, or made to be a joke, whatever the outcome. 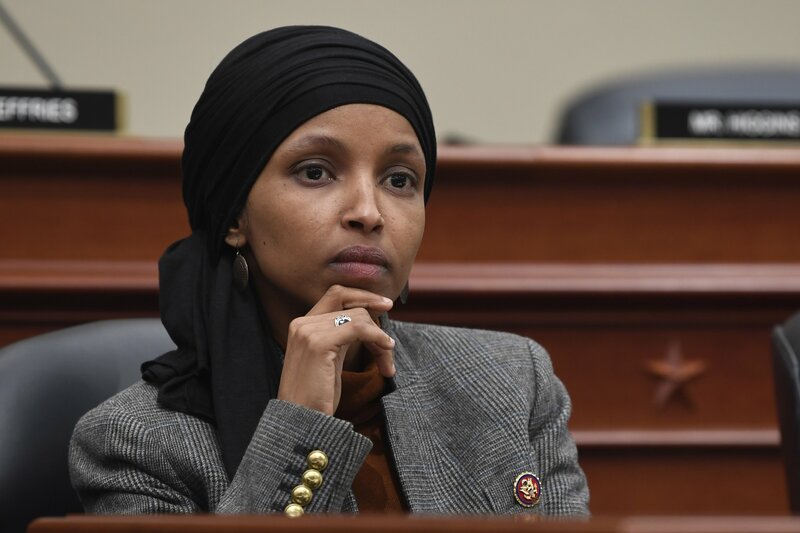 The FBI said in a criminal complaint Patrick Carlineo Jr. called her a "terrorist"
Federal prosecutors announced Friday that Patrick Carlineo Jr. was arrested after placing a threatening call to Omar’s office in Washington D.C. last month. Trump is brilliant at playing his base. I don’t think they even know what he’s doing. You forgot the part that at the same time fat donald’s energy department is preparing to share nuclear technology with the country from which most of the 9/11 terrorists came from. I love how Trump is now using 9/11 for political leverage. It will work with his base. It’s brilliant. Less than human, yeah, but politically brilliant.